Early on when I started developing my hemoglobin based technique, I would do small test paintings; mostly to get a feel for how the blood would react with other materials. Surprisingly, some of these test turned out to be worthy of being called an abstract painting. Although I don’t consider myself to be an abstract painter I was pleased to see these paintings sell. Many people have expressed a fondness for these works where I've let the blood do more of its own thing. For that reason I decided to create a small body of work that gave more attention to the natural properties of blood. Of course I still had to incorporate the figure into the larger pieces, but on a more simplified level. For the entire month of May these paintings will be on display at the Silver Queen Fine Art Gallery located at 577 Main Street in Old Town Park City, UT. The Park City Gallery Association holds a Last Friday Gallery Stroll at the end of every month; from 6:00 to 9:00 p.m. Members of the Park City Gallery Association offer a unique showcase highlighting artists, special exhibits and art events. For this month the last Friday falls on May 31st. The Gallery Stroll is a free community event that gives locals and Park City visitors alike the opportunity to enjoy light refreshments while exploring Park City’s exciting art scene. For a link to the gallery stroll map click here. 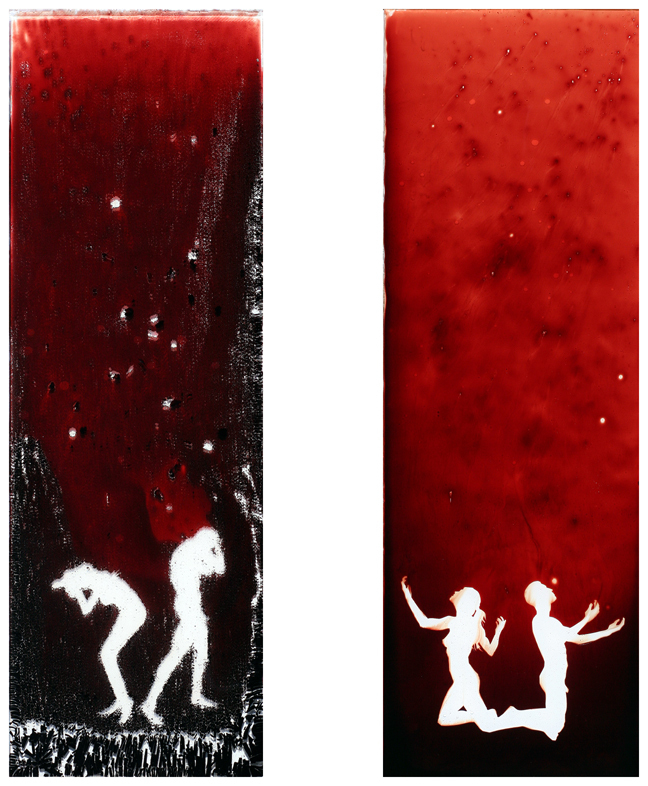 The two paintings shown above, “Lost” and “Found”, depict an opposing contrast to each other both in the materials natural reactions and the body language of the figures. “Lost” is riddled with cracks in the fractured blood as the man and woman below weep in anguish. Contrary, “Found” has a smooth transition in the warm hue, seemingly growing lighter on the alleviated figures below. A total of nine paintings were done in this body of work. Two of the small 6”x 6” paintings, one blue and one yellow, were done with only ink. Although the ink behaved much differently that the blood I've become accustom to working with, they brought a nice variety to the assortment. Images of the nine paintings won’t be posted to my website until the end of the month, after the gallery stroll. Due to the response my paintings received through last month, the Silver Queen Fine Art Gallery is extending the display of my work until the end of June. With the ranging responses of shocked, delighted, and everything in between, gallery visitors have had much to talk about in regards to the nine of my paintings on display. So if you didn't have a chance to see them last month or you want to see them again, you’re in luck. My work will stay up until the end of June and will be part of the Last Friday Gallery Stroll for this month as well – June 28th.